This large 5 bedroomed property boasts a massive living area of nearly 1000m2 (10,760 sq ft). There are fantastic views over Ferradura beach and the property is within a 2 minute walk of the beach. The house features two large Master Suites, both with Jacuzzis and three further good-sized bedrooms, all en-suite. All the bedrooms look over the beach. There is a large kitchen, a dining room which seats 10, a sitting room and a cinema room as well as a large games room downstairs. 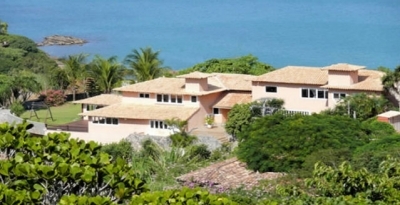 The property is located in an elevated position overlooking Ferradura beach, the best beach in Buzios but is less than a 5 minute drive to the shops and restaurants of Buzios itself. The villa can accommodate 10 adults with its 5 double bedrooms, and in brief comprises of, 2 oversized master suites with double beds, jacuzzis and walk-in closets, 3 twin/double bedrooms, all bedrooms are en-suite, living room, Dining room, well equipped kitchen, cinema room, swimming pool with panoramic views of Ferradura Beach, gazebo with barbeque area, and large games room.